KATHMANDU, Nepal, April 27, 2015 (ENS) – The death toll has reached 4,438 following the 7.8 magnitude earthquake that rocked Nepal and surrounding countries on Saturday, while more than 8,000 others are injured. The death toll is still expected to rise as rescuers reach remote villages now cut off by landslides. Police officials said that in Nepal 3,904 people have been confirmed dead; 72 people in India, 25 in Tibet, and two in Bangladesh also died, bringing the total to over 4,000. The massive quake, which toppled office buildings, homes, temples and World Heritage monuments in Kathmandu, was the strongest and deadliest to shake the region in 80 years. With continuous aftershocks that have reached magnitude 6.5, the government says a total of 60 districts have been affected by the massive quake. 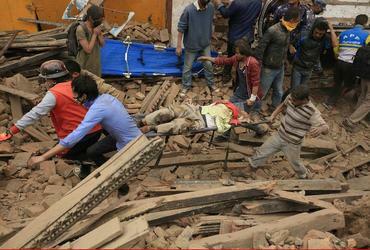 Frightened Kathmandu residents huddled in the streets for fear their homes could come crashing down in a powerful aftershock. According to Nepal’s Army, people are still trapped in 19 places in Kathmandu and rescue teams have not yet been able to bring the victims out of the rubble. An avalanche on Mount Everest, the world’s tallest peak, partially destroyed the base camp, killing 18 people, including several foreign climbers. The United Nations says eight million people have been affected by the earthquake, 6,800 are injured and 1.4 million need food aid. “In this fragile country where nearly a third of the population lives in poverty, the suffering caused by the destruction of lives and livelihoods could last years,” said Mercy Corps Founder Dan O’Neill. 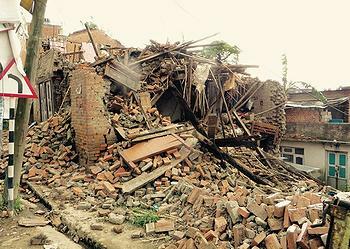 Four out of the seven UNESCO World Heritage sites in the Kathmandu Valley were damaged. Many buildings in Kathmandu’s Durbar Square, the royal Nepalese residence until the 19th century, were destroyed. In response to the Government of Nepal’s appeal for help from the international community, relief funds, rescue teams and medical assistance has been pouring in from around the world. 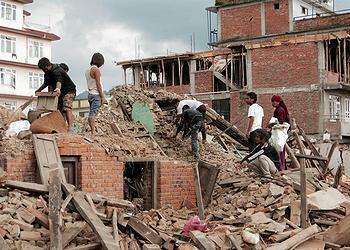 The Asian Development Bank will provide a $3 million grant to Nepal to support immediate relief efforts. ADB President Takehiko Nakao said the bank will provide the money immediately from the Asia Pacific Disaster Response Fund to meet humanitarian needs such as tents, medical assistance, food and drinking water in earthquake-hit areas. This will be followed by up to $200 million in additional resources for projects during the first phase of rehabilitation. Within hours of Saturday’s tragedy, the World Health Organization disbursed medical supplies to cover the health needs of more than 40,000 people for three months. These medicines, disposables and instruments as well as water sterilization equipment were given to hospitals in Nepal treating the injured. WHO is sending a team of 10 public health and disaster response experts to support the government of Nepal in public health, epidemiology, disease surveillance, logistics and mental health. WHO has received offers from 14 countries and partners willing to send in medical teams. Additional foreign medical teams are needed, especially those with trauma and surgical capacities, who can be self-sufficient in their operations. WHO immediately made available US$175,000 to Nepal’s Ministry of Health, and in addition, WHO appealed for US$5 million for its ongoing humanitarian response to the disaster in Nepal. 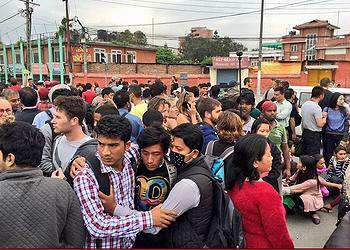 On Saturday, the United States made an initial US$1 million available to Nepal for humanitarian assistance. Today, Secretary John Kerry added $9 million to that for a total of $10 million. The European Commission is making available €3 million in its immediate response to the quake, to go towards clean water, medicine, emergency shelter and telecommunications. The European Commission has sent humanitarian aid and civil protection experts to the crisis area. The EU Civil Protection Mechanism has been activated. Through it, Belgium, Finland, Germany, Greece, Netherlands, Poland and Sweden immediately offered urgently needed search and rescue teams, water purification systems and technical assistance. Other Member States have expressed their willingness to help. The European Commission will co-finance the transport of EU aid to Nepal. A British Royal Air Force plane loaded with aid arrived in Nepal on Monday. British volunteers are helping with search-and-rescue operations. The Israeli military said three aid-filled planes have left for Nepal and three more departures are planned. 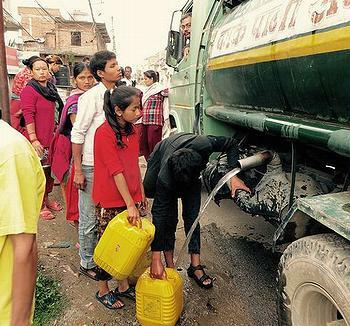 India is stepping up its efforts to help Nepal. The Indian Air Force has airlifted five tonnes of milk and 14 tonnes of food in addition to light vehicles, oxygen regenerators, medicines, blankets and tents. India also sent in three teams from the National Disaster Relief Force, two field hospitals and two Air Force Communication Centre vehicles. With the weather improving in Nepal today, extensive helicopter operations are underway. A total of 87 casualties have been evacuated to a safer places and 3.5 tonnes of relief have been air dropped into inaccessible areas. A total of 2,305 stranded persons have been evacuated from Kathmandu to India. The death toll in China’s Tibet Autonomous Region has risen to 25 and 117 others were injured, according to the regional disaster relief headquarters. Nine Chinese military helicopters have arrived in Tibet’s quake-hit Xigaze City to help with relief work. China has dispatched 158 engineers to Tibet in order to restore telecommunication facilities destroyed by Saturday’s earthquake, the Chinese government said a statement Monday. In addition, China has canceled spring climbs on the northern slopes of Mount Qomolangma in Tibet.